How about these hunks of the U.S. Gymnastics team. Jake Dalton posted this pic to his Instagram profile and sent the internet into a frenzy. Do you have a favorite? Comment below and let us know who it is. aussieBum was fortunate enough to meet up with Matthew Mitcham before he embarked on his quest for Olympic Gold in Beijing and they got a bit of an insight into a remarkable young man who has got to live out his dreams! Join the aussieBum family in congratulating Matthew on living out his dreams! IN his long career as one of Australia's favourite cricketers, paceman Brett Lee has never been one to stand accused of ball tampering. Before now, that is. With his own mens underwear and pajama range set to rol l out, the cheeky bowler admits he has spent months picking at seams - for fashion's sake. Having turned his hand to Bollywood (to rave reviews), Lee has teamed up with celebrity creative Bruno Schiavi to launch the designer label, Acestar. "We're bowling in tandem," Lee told Confidential about the new joint venture with Schiavi, who has made millions through similar deals with Delta Goodrem and Priscilla Presley. Lee has spent six months sketching and sourcing briefs, even road-testing the smalls on his Cricket Australia teammates. After taking five wickets for 59 yesterday on tour in the West Indies, clearly the comfort factor of Lee's smalls side business is having an impressive effect on his game. "Well, cricket is all about confidence. You've got to be comfortable out there," he said. While not exactly fumbling through players' lockers, Lee said the stylistas of the Test team, including Shane Watson, Mitchell Johnson and Michael Clarke, had offered, um, support and handy hints. The range will feature cricketing touches, such as stitching to reflect the seam of a shiny six-stitcher. But the cricketing jocks have vowed to leave the modelling to their mate "Bing". "There's nothing fabricated," Lee said, laughing off fears about exposing himself and his package for the advertising shoot next month. Super Bowl Sunday some reasons to watch! Well tomorrow is Super Bowl Sunday and whether you are a football fan or not there are plenty of reasons to watch! So if you are gearing up for the 41st meeting here are some vital tips that any underwear fanatic should know. 1st - You may or may not be a fan of the 2 teams that are in the Super Bowl this year but the match up between the Chicago Bears and the Indianapolis Colts couldn't be any better... why you ask? Because both teams have WHITE football pants! 2nd - Rex Grossman the Chicago Bears quarterback has led his team to the ultimate game of the year all while making his uniform look great! This 26 year old 6'1" guy is one reason to stay tuned to any Super Bowl game. 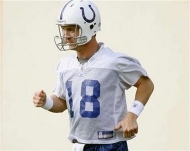 3rd - Peyton Manning. If it wasn't good enough to have just one good looking quarterback throw in a second. This Colt is worth checking out at 30 years old and a whopping 6'5" he is a lot to look at! 4th - The Fans. If you don't get enough eye candy on the field then check out the view in the stands with this years Bowl being in Miami the weather will be nice and the boys shirts are sure to be off. Watch for those underwear waist bands to be showing! Well hopefully you will have an underwear filled Super Bowl and if your not watching go check out some of the underwear sites on the left. There are pages full of guys in just their jockstrap to make your Sunday more enjoyable.